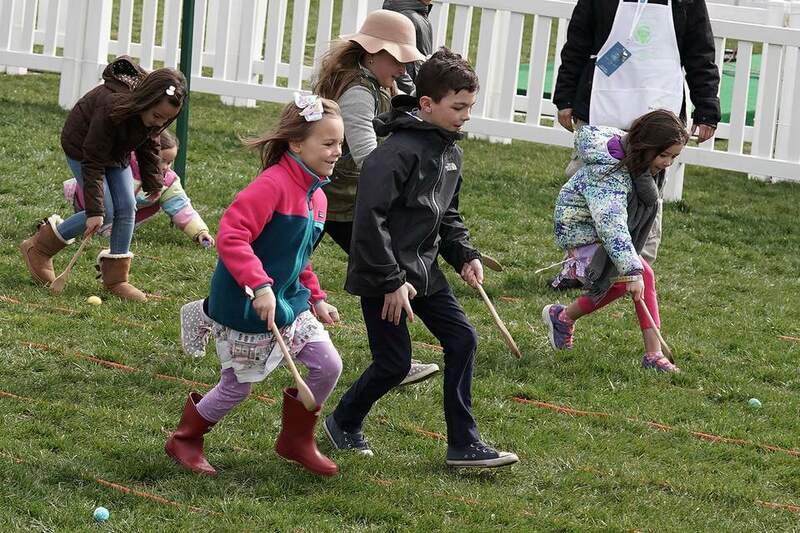 The White House Easter Egg Roll is an annual family event to hunt for and race Easter eggs on the White House Lawn while enjoying storytelling and a visit with the Easter Bunny. While there are many Easter events in Washington, D.C., this annual tradition dates back to 1878. President Rutherford B. Hayes officially opened the White House grounds to local children for egg rolling on Easter Monday in 1878. Successive Presidents have continued the tradition of inviting children to the White House Lawn for egg rolling and other activities and entertainment. This year, the White House will open the South Lawn to families to enjoy live musical performances, storytelling, and the traditional White House Easter Egg Roll on Monday, April 22, 2019. All guests will enter the event from the Ellipse and will go through a security screening process. Consult a map of the White House area for more details on entering this 1600 Pennsylvania Avenue attraction. Tickets are distributed free of charge via an online lottery system, allowing guests from across the United States to participate. All attendees must have a ticket, and the 2019 ticket lottery opens on February 28, 2019 at 10 a.m. EST and closes at March 4, 2019 at 10 a.m. EST. The winners will be announced on March 14, 2019. All attendees will be required to go through a security screening process. No food or beverages are allowed on the grounds. Duffel Bags, suitcases, and backpacks are not allowed, but strollers, diaper bags, baby formula, and baby bottles are permitted. The event features an egg hunt and the traditional egg roll along with live musical performances that appropriate for all ages. Celebrities also bring books to life with storytime, and kids will enjoy egg dying, egg decorating, and interactive, educational activities designed to spark scientific curiosity an creativity. The Easter Egg Roll is the longest held annual presidential tradition. Informal egg roll parties were recorded at the White House during the early Lincoln administration. During the post-Civil War years, the Easter egg games were played on the grounds surrounding the U.S. Capitol Building. In 1876, an act of Congress outlawed the Capitol grounds and terraces from being used as playgrounds to protect the property from destruction. In 1878, President Rutherford B. Hayes officially opened the White House grounds to local children for egg rolling on Easter Monday. During World War I and II, the events were canceled, and Dwight D. Eisenhower and First Lady Mamie Eisenhower revived the event in 1953 after a 12-year absence. In 1969, Pat Nixon's staff introduced the White House Easter Bunny, a staffer dressed in a white fleece bunny costume who roamed the grounds and welcomed the egg rollers and posed for photographs. By 1974 the activities evolved into organized egg-rolling races. The 1981 eggstravaganza included assorted clowns and characters, balloon vendors, Broadway show vignettes, a petting zoo, exhibits of antique cars, and an eggxposition of specially decorated eggs (one for each state). Each egg roller receives a goody bag filled with a program, toy products supplied by corporate sponsors, and food. Since 1987, the event's theme has been inscribed on each egg, and by 1989 George and Barbara Bush added their facsimile signatures. Today the official eggs are given out to each child (under 12) as they leave the South Lawn.